I’ve now got to grips with the state of the alternate world order in 1444 after converting my CKII save to EUIV. 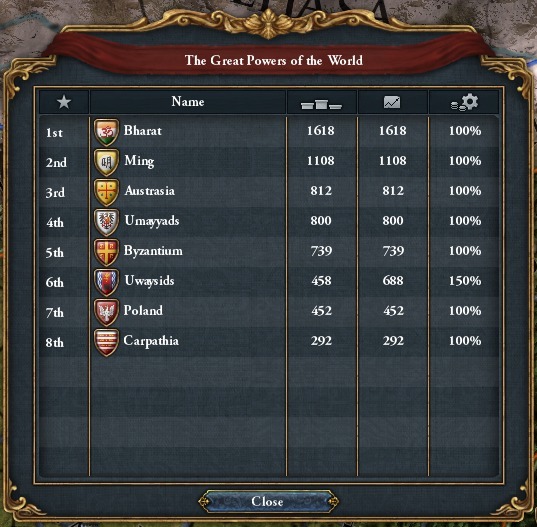 The Great Powers are a little different but are largely geographically representative of the vanilla 1444 start. The great exception is obviously the country under my own instruction – Bharat – which in the years up to 1500 geared its economy towards superpower status, in part due to hefty trade steering. If you want to be notified of updates to this Paradox mega-campaign, make sure to subscribe and follow. To Trade or to Explore? I made a number of changes in my last post without fully understanding their implications. Not least amongst these was splashing out for lots of expensive advisors. I started the game with +31.50 ducats per month. Within the first year, I’d manged to drop this to -4.29 per month. I might be the world’s greatest power, but I can’t just spend what I please without accepting the consequences. EUIV lets you drill into the economic stats of your country pretty easily (unlike CKII), so I was able to spot where all my cash was going. In the first instance, at least, it was easier for me to identify what was costing me a lot and reducing those costs than trying to figure out how to generate money. Fleet and army maintenance were both pretty high. I figured I didn’t really need my fleet right now, so I disbanded that at the start of 1445. In hindsight, this probably wasn’t the smartest move, as I could have used the fleet for trade. But more on that later. My army I would need as there were a number of rebel armies in the territory of my two vassals, Karkotas and Bhattis. I could have lowered the maintenance on these armies rather than straight-up disbanding them, but doing so reduces the rate at which armies reinforce and reduces their morale. This might not seem like it could hurt you that much if you used it smartly, but I’ve found that you can’t rely much on the numbers (e.g. your 60k army versus their 40k army) if you have an underfunded army; low morale hurts, and if some rebels or natives pop up unexpectedly, they can cause a lot more damage than expected if you’ve got undermaintained armies. I’m sure there’s a situation in which lowering army maintenance would be useful. 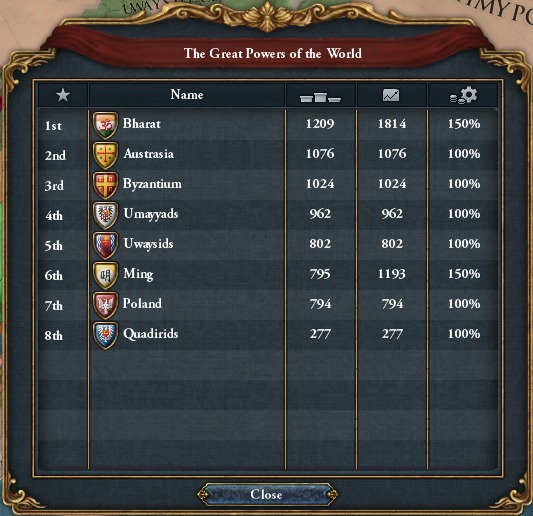 Acting as the world’s greatest power is not it. Some rebels were directly fighting me, others were fighting my vassals. I was capable of handling both, but my vassals weren’t able to take care of themselves. Forts have to be built in a province. They take up a building slot, like other types of building. Once a fort is built, it incurs monthly maintenance. The level of monthly maintenance depends on whether the fort is active or mothballed. 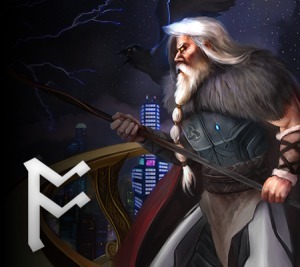 When it’s active, the maintenance is 1 ducat per month multiplied by the fort level (up to level 8). When it’s mothballed, the maintenance is halved, but the fort doesn’t have an affect on sieges at all. Therefore you’re paying monthly for the possibility of activating the fort. You can totally destroy a fort rather than mothball it to remove the maintenance cost entirely. The actual effects of forts are another thing entirely. I’ll come back to forts and the zone of control in a later post. Understanding maintenance was sufficient for me at this point because I realised I could destroy a handful of forts I didn’t anticipate needing; these were away from the borders I shared with potential enemies. The remaining forts I mothballed because I intend to focus my efforts internally to begin with. 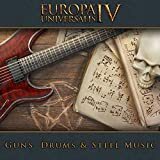 There are a number of mechanics in EUIV that let you specialise your nation so that it has a particular set of advantages over any other nation. There’s a lot of opportunity for synergy between these different mechanisms so that you can become highly specialised in some area (at the expense of others) or become a bit more of a generalist. In the first 50-or-so years of gameplay, I had to understand how some of these mechanisms would affect the long-game because not all of the decisions are easy to undo. Once a nation reaches level 5 in Administrative tech – a technology called “National Ideas” – its able to pick its first Idea Group. Idea Groups contain seven Ideas each. An Idea provides a passive bonus to your nation and are generally quite powerful. From another perspective, these Idea Groups let you shape the nation to suit your play-style or role-play. There are 19 Idea Groups in total to choose from, separated into Administrative, Diplomatic, and Military groups. You may choose eight of these throughout the game, but there are some restrictions on how you distribute your choices. (You can’t just pick all Military, for example.) Each Idea costs a certain amount of Monarch Power to unlock from the category that the Idea Group falls within i.e. an Idea from an Administrative Idea Group will cost Administrative Monarch Power. In addition, every country has a set of National Ideas, which are set from the start of the game. (If you form a new country as part of gameplay, you’ll be given the option to switch your National Ideas too.) Unlike other Ideas, these don’t cost Monarch Power to unlock, but the first one is adopted by default (called “Traditions”) and one is unlocked for every third Idea you unlock from other Idea Groups. Bharat shares National Ideas within the Bengali group of National Ideas, which has some good trade and tax bonuses, amongst other things. Bharat’s “Traditions” National Idea gives +10% Trade Steering and +3 Tolerance of Heathens. Both of these are good for my particular situation, the latter because there is a good mix of religions in and around Bharat. On the 1st August 1455, I teched-up to Administrative 5 “National Ideas” and was able to select my first Idea Group. The choice is a little overwhelming for a newbie, but there are some decent guides sprinkled about that give you an idea of what you might do in an optimal-build situation, such as this one from /r/EU4 on Reddit (for an older version of EUIV). As Bharat, my decision was between Trade and Exploration. The Reddit post above suggests Trade is a good Diplomatic Idea Group and Exploration is not so good. Still, I was keen to turn history on its head and set out as a colonial India from the get-go. I decided that, in these early stages, I would prefer to set myself up as the dominant trading nation in and around the Indian Ocean, then perhaps later branch out with some colonisation. The nearest colonial regions are East Africa, South Africa, and the South Pacific (including Australia). If my primary goal is to increase income through trade, neither of the former two options are particularly well-suited to this because the trade flows westwards from there. (See the Trade Steering section below for more on my trade strategy.) The South Pacific is more alluring, but I also don’t think I’ll be up against much competition in the early game for these provinces because East Asian countries, as I understand it, don’t have a particular predilection to start colonising. I also don’t want to totally out-gun my competition. I’m sure I could play this super-optimally and aggressively, but I have to bear in mind that I’ll be playing this campaign through Victoria II and Hearts of Iron IV, and I want there to be some competition, even if that’s artificially induced. Choosing not to jump on colonisation from the outset means that some of the European powers might get a head start on colonising the New World, giving them opportunity to grow alongside me through the game. August 1455: First Idea Group, Trade (a Diplomatic Idea Group). March 1459: Shrewd Commerce Practices (Trade Idea Group), granting +20% Global Trade Power and +0.1% Corruption. From 1459 to 1460, this resulted in my monthly income jumping from +34.40 to +49.17, a 43% increase from a single Idea! November 1461: Free Trade (Trade Idea Group), granting me an extra Merchant. I used it to transfer trade from Kashmir to Doab, transferring 4.7 ducats forwards (previously 0.6). 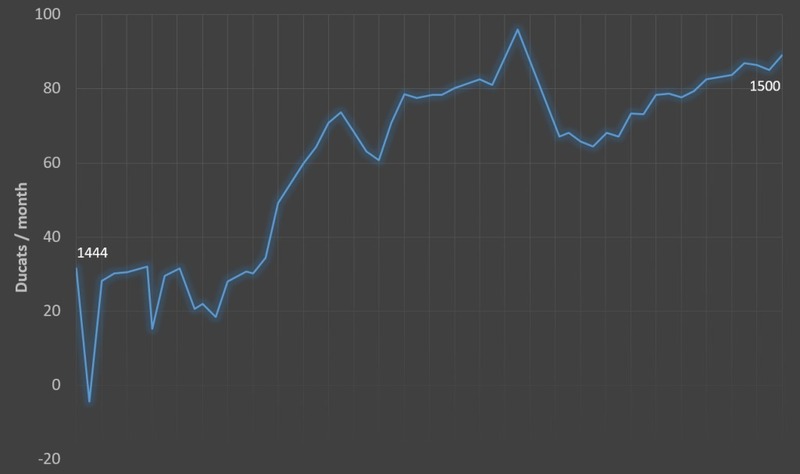 From 1460 to 1462, my monthly income grows from +49.17 to +59.99. September 1464: Merchant Adventures (Trade Idea Group), granting me +25% Trade Range. My Bengali Idea Group also advances, since this is my third Idea, unlocking Bengali Hindu-Sufi Syncretism, which grants +50% Religious Unity. August 1472: Second Idea Group, Economic (an Administrative Idea Group). October 1473: National Trade Policy (Trade Idea Group), giving +10% Trade Efficiency. My income raises from +78.34 to +80.29 between 1473 and 1474. November 1474: Bureaucracy (Economic Idea Group), increasing my National Tax Modifier by +10%. Income increases from +80.29 in 1474 to +82.51 in 1476. June 1478: Organized Construction (Economic Idea Group), reducing construction cost by 10%. My Bengali Idea Group also advances, unlocking Ganges-Brahmaputra Confluence for +10% Trade Efficiency. Between 1477 and 1479, my income increased from +81.12 to +95.94. April 1482: Overseas Merchants (Trade Idea Group), granting me an extra Merchant. April 1486: Trade Manipulation (Trade Idea Group), increasing Trade Steering by 25%. January 1487: National Bank (Economic Idea Group), reducing Yearly Inflation by 0.1. 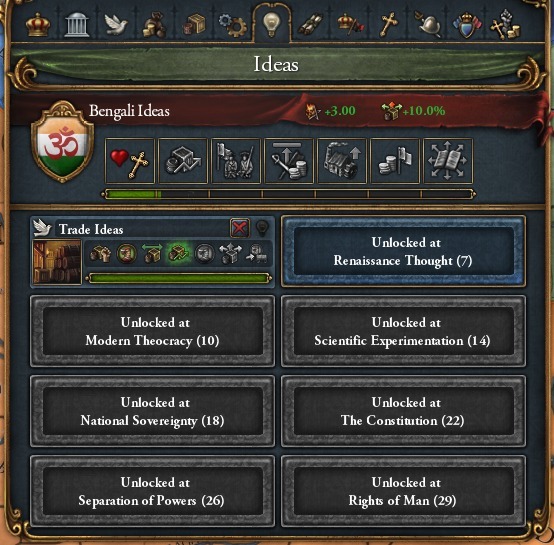 My Bengali Idea Group advances again, unlocking Bengal’s Endlessly Productive Rice Fields, increasing National Manpower by +20%. So I made good progress in both the Trade and Economic Idea Groups, both of which were intended to improve my economy. And improve it they did! The graph below shows the change in my monthly income between 1444 and 1500. A country can make a Decision if certain conditions are met, and these decisions can have both positive and negative consequences. You never have to make a decision, but it can often be in your interests to do so. Bharat made its first Decision in June 1446 to “Support the Advaita Movement”, giving -1 National Unrest and +2% Missionary Strength. This will help in converting my vast and diverse empire to Hinduism. The term Advaita refers to the idea that the soul is the same as the highest metaphysical reality in Advaita Vendata school of Hinduism. I could have chosen to “Support the Haridasa Movement” instead, which would have given -10% Stability Cost instead of -1 National Unrest, but these two Decisions are mutually exclusive. There’s also a Decision available to me to “Accept Religious Sects”, but this was not desirable for me because there weren’t a lot of heretics in my empire and, for the few there were, my Missionaries would be less effective against them. As mentioned, one never has to make a Decision, so I chose not to make this one. The timeline in EUIV is split into four Ages and each Age has a number of associated Abilities that a country can acquire by fulfilling Age Objectives. Fulfilling Objectives grants a mana called Splendor, which can be spent on the Abilities. March 1461: Higher Developed Colonies – Provides bonuses to benefit new colonies. This won’t be useful until I start colonising provinces, obviously, but I thought it would be good to get this under my belt because it would provide more benefit the earlier I managed to grab it. June 1474: Improved Wartaxes – Beneficial during wartime, if one decides to raise War Taxes, which comes at a cost of Military Monarch Power. 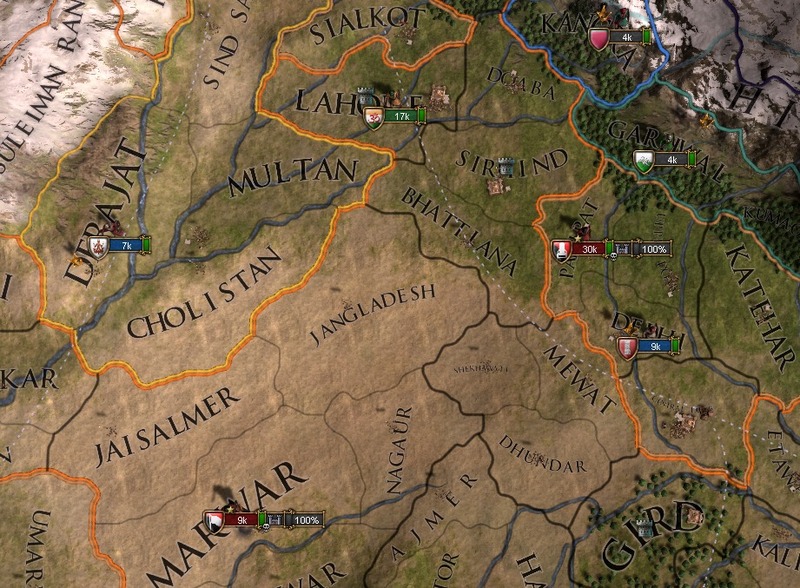 September 1487: Adaptive Combat Terrain – Provides combat bonuses on certain terrain types. I think this is supposed to be most useful in defending provinces close to your capital, as you gain the bonuses on terrain types identical to that of your capital province. Upon sizing up Bharat’s position in the EUIV world, I was more-or-less immediately sure that I wanted to be a dominant trade power; at least in the Indian Ocean. Trade in EUIV is an important component of your country’s income. 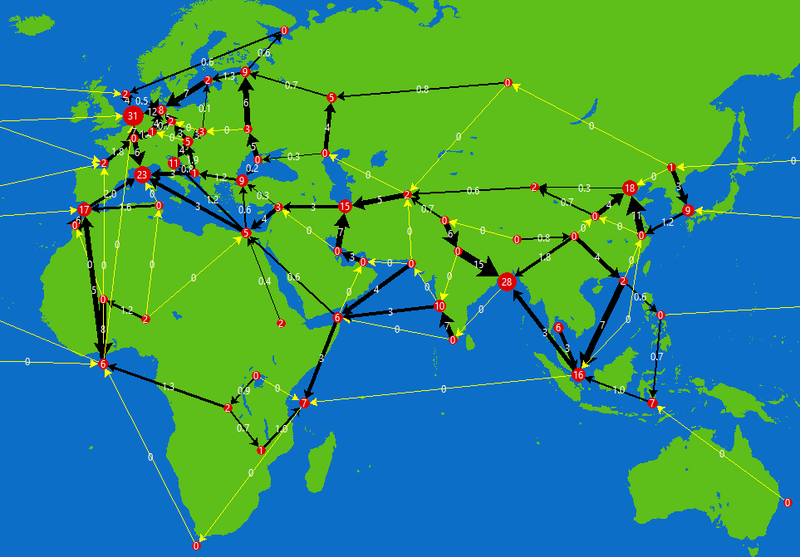 It relies on manipulating trade in Trade Nodes, which are distributed throughout the world in historic locations and connected by trade routes mirroring historic ones. The trade network looks like the below. Trade in EUIV, I think, is one of the most complicated mechanisms to understand, but it’s also very rewarding. There are lots of tooltips and other hints in the game that help to understand the trade network and the effects your actions have upon it. There are also lots of guides online to understanding this, so I’m not going to write a start-to-finish guide here, but I will explain why I made my own decisions, which may be based on a flawed understanding of this system. Merchants are the primary means by which you will influence trade in the world. They are assigned to Trade Nodes and may either Collect in that node or Steer trade from that node. When a Merchant steers trade, he or she adds value on top of the steered value. The total value added increases up to a cumulative +11.3% if you have five merchants in a row steering trade. For this reason, it can be beneficial to steer trade through a number of connected nodes that are largely under your control and collect at the end of it. You will also collect trade in the country’s “Home Node”. Trade Range is a value applied to your whole country and is the distance from a cored province, a cored province of a subject nation, or a cored province of a nation granting Naval Basing Rights at which a Merchant may operate. In other words, the greater the Trade Range, the further afield you can send Merchants to steer or collect trade. Increasing Trade Range can be useful in making sure you direct trade into the node or nodes from which you’re collecting. By proxy, it punishes your competition, as more ducats flowing into your nodes means fewer flowing into theirs. Trade Power is generated by multiple sources, such as Provincial Trade Power, transfers from other countries (a diplomatic option), Trade Companies, and Trade Protection by your navy. These are also multiplied by any Trade Power modifiers. Trade Power is distributed on a node-by-node basis. Its not the absolute amount of Trade Power you have in a node that matters, but how it compares to the total Trade Power applied in that node by all countries competing for it. You will then steer or collect a percentage of trade based on the percentage of the total Trade Power applied by you. In-game, this has the effect of generating Trade Nodes with a lot of competition that you’ll need to exert a significant amount of influence on to have any effect. Similarly, and in combination with Trade Range, there may be Trade Nodes that are hidden deep within your empire that other nations aren’t able to reach, or there would be no direct benefit in influencing it, so they end up very low competition and you have to expend hardly any influence in manipulating the trade in just the way that you want. I took a lot of steps to increase my trade competitiveness in my immediate vicinity. This covered all the Trade Nodes from Southeast Asia, through the Indian subcontinent and the Indian Ocean, and out to the Middle East. I also adopted Surya as my Personal Deity (as mentioned in my last post), giving +10% Trade Efficiency (amongst other things), for a total of +20%. November 1444: Embargoed Ming and the Umayyids, my rivals, reducing their Trade Effectiveness in nodes in which we compete. May 1458: Asked my ally, Pegu, based in Southeast Asia, to transfer 49% of their Trade Power to me. This is a diplomatic action available if you have good relations with a target country and, presumably, have some reason for them to be so generous towards you. February 1467: Asked another ally, Ajuuraan, based in East Africa, to transfer 50% of their Trade Power to me. If you look at the trade network map above, you’ll noticed that trade in East Africa is transferred south and around Africa to Europe. The reason I bothered with Ajuuraan is because they’re competing in the Gulf of Aden and Goa, which are much more relevant to me (and upstream for them). Merchant 1: Transferring trade from Kashmir to Doab. Merchant 2: Collecting trade in Goa. Merchant 3: Transferring trade from Ceylon to Goa. Merchant 4: Collecting trade in Gulf of Aden. Knowing what I know about trade now, I’m sure this was not optimal, but it was enough to help towards trebling my monthly income over the course of 50-or-so years. Finally, I started to build Light Ships to send them on missions to protect trade, which increases your trade power on the selected (coastal) node. There’s a great feature where, when you’re choosing a node for which the Light Ships should protect trade, it’ll tell you the expected profit based on your fleet maintenance and the increased trade power. However, I don’t think this is entirely accurate; I noticed my income changed a lot less than indicated by this tool tip. By 1500, the state of global trade looked like the below. Merchant 1 acted on the large arrow with value 15 in the north of India. Merchant 2 collected trade in the node with value 10 on the west coast of India. Merchant 3 acted on the arrow with value 7 from the southern tip of India to the west coast. Merchant 4 collected trade in the node with value 6 near the Horn of Africa. 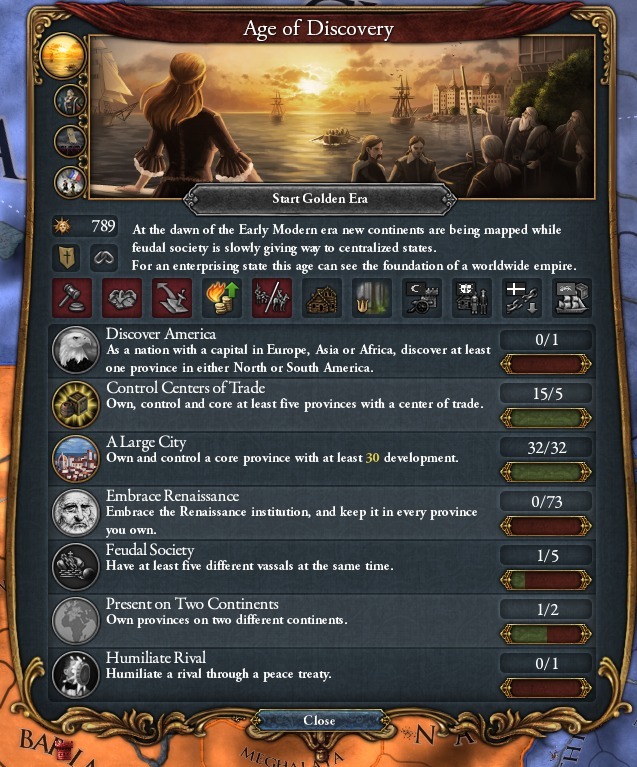 The New World is excluded because there’s zero trade there at this stage in the game. The most valuable trade node at this time was in the English Channel (value 31). Bengal was a close second (value 28). 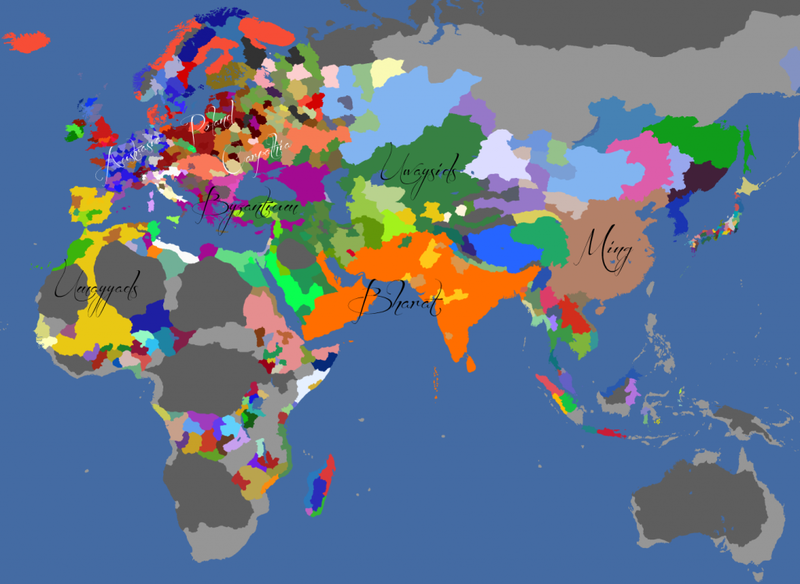 Note that this map was generated with the EU4 Trade Visualizer by Junuxx. This tool allows you to examine your save files for this sort of trade data. I recommend giving it a look! In the years up to 1500, I wielded my diplomatic rather than military power to start expanding my borders. Of course, I wanted to subsume my two vassals, Karkotas and Bhattis, to reunify the subcontinent following on from the CKII conversion. Bhattis was annexing January 1455 and Karkotas in December 1455. Apart from this, I targeted small, vulnerable nations at my border that were likely to submit to being my vassal in the first instance. You can’t annex a nation without them first being your vassal for 10 years. Ripe for this sort of treatment were Nepal, Kangra, and Guge, annexed in 1479, 1485, and 1499, respectively. If you still have subjects when you annex a nation, they get a bit upset about this for a little while. This didn’t turn out to be enough to press on with this sort of expansion. I felt a bit better about it, too, since I was just romping about with my army. Institutions are fundamental advances in civilisation. Failing to embrace them means increased technology costs for your country. There are seven that will appear throughout the game around defined dates. They will appear in some province, which has different requirements for each institution. The first institution is Feudalism, which is adopted by default by most of the Old World (with a few exceptions). Bharat, therefore, had already adopted this. The first one of any real consequence was the Renaissance, which appears in an Italian region after 1450 in either a capital or a province with a development of 20 or more. I only saw the Renaissance start creeping across the Mediterranean in the Levant in 1473. Bharat still hadn’t managed to embrace this institution by 1500… I suppose the tech penalty will go some way to evening the playing field between me and my global competitors. The Great Powers have shifted. I’m suffering for not adopted Renaissance 50 years after it appeared. The only other Great Power to not yet adopt it is Ming, which I’m pleased about, because they’re my neighbour! They’re further East than me so are likely to be the last to adopt it. The order has changed slightly. This is a little distorted by the fact that Ming hasn’t managed to adopt Renaissance yet. Carpathia has fallen off to be replaced by Quadirids, an empire on the west coast of the Arabian Peninsula. Borders have also moved, unsurprisingly! Old World map showing the Great Powers of 1444. 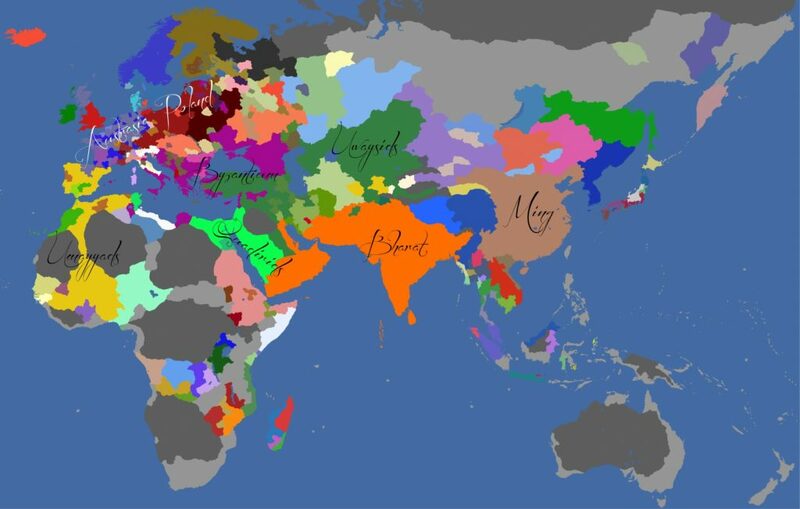 Old World map showing the Great Powers of 1500. There don’t seem to have been any major changes, though all of the Great Powers have obviously expanded. In particular, Austrasia and Poland are consolidating their territories in Europe. The Umayyads have arguably lost a little territory and are struggling a bit in Africa. It’s obvious now why the Quadirids have entered the Great Powers board, though that appears to be the result of their own growth rather than Carpathia’s loss. I, playing Bharat, have consolidated territory too, having subsumed a few vassals. Asides from the Great Powers, there are a few other changes. There’s a new substantial presence in Central Africa, though I’m not sure who this is. The myriad Japanese nations have coalesced into a handful, though I’m sure they’ll be fighting for centuries to come yet. Korea has made some progress up to the Northeast Asian coast. The nations of Scandinavia are starting to fall under just a couple of banners. In general, it appears as if the border gore of CKII is being undone a little by some of EUIV’s own mechanisms. This is nice to see! From 1500 to 1550, I start exploring undiscovered parts of the world. This includes the islands of Southeast Asia towards Australia and New Zealand. Upon these islands I land my first colonists and settlers. I also step up my naval trading game and engage in my first war!